Sorry about my sporadic entries lately, but my home theater finally received a big upgrade over the weekend. I've been mulling over the prospects of a new display and I took the plunge with a Panasonic Viera TC-P50VT25. The 50" model of their 1080p THX-certified flagship plasma line for 2010. I settled on this one due to the rave reviews from places like CNET and Home Theater Review. This is also the first series to debut since Panasonic acquired many of ex-Pioneer technicians that formerly worked on their discontinued but "best-ever" KURO plasmas. First impression? This display certainly blows away my prior high definition display, a Samsung HLP-5085W DLP. That set was only 720p, but I can't be too hard on the ol' girl. She was that manufacturer's 2004 flagship television with image quality and a feature-set that blew away other displays at that time. The image processing was Faroudja's excellent DCDi de-interlacing (FLI2310-LF) paired with Texas Instruments fabled HD2+ Mustang chipset. 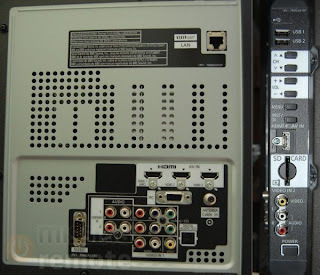 HDMI was in its infancy, so only one connection was included (the VT25 has 4), but it was Version 1.0 which meant much less DRM and conflicts experienced in later revisions. This DLP also had a unique pedestal design with all of the internals housed in a center column with the screen resting on top all supported by a wide glass base. Certainly not the most mobile television, but when calibrated the image was quite pleasing and I never experience an issue with its operation (aside from a required changing of the lamp after a few thousand hours). But that's the past, right out of the box this Panny handedly beats my old display by a huge margin, and presumably every other lamp-based DLP in existence. Image quality is fantastic--be it Blu-ray, HD cable, or DVD. Black levels are incredibly deep and inky while colors are extremely vibrant yet natural. No posterization, false contours, or phosphor lag that I can see. All anchored by a rich set of picture adjustments, including a near-perfect preset THX mode, that can be tweaked to yield incredible accuracy. The 1080p panel is capable of 1:1 pixel mapping using the Fill/Size 2 picture format option. There's also your usual unadvised zoom/stretch options. "jack pack back/left side panel"
There shouldn't be any question Blu-ray looks great (feed by a "fat" 60GB PS3) and this plasma displays film's native 24fps rate as well as offering 48Hz/96Hz frame doubling/tripling. I personally prefer the "judder" of 24 frame-per-second film and not the unnaturally smooth "video-like" appearance of this additional processing (also known as 120Hz/240Hz in LCDs); I'm fine with 24fps for film content and 60Hz for video content. 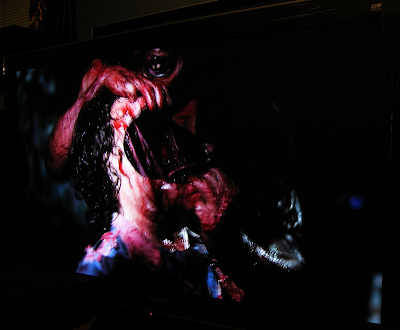 So far I've checked out Hatchet, The Evil Dead, Crank, A Nightmare on Elm Street, Avatar, and a slew of title sampling. I'm literally blown away. So clear you can get within inches of the screen and fine detail remains tack-sharp. DVD might be the more of a story here, but this could be the player over the VT25--the now discontinued Oppo DV-980H. This player was the "lowest-end" offering in their last series of universal DVD players before shifting to Blu-ray units. Despite that, the 980H might be the best performing single chip DVD player ever produced. I loved the 720p upconversion and now it's only better scaling to 1080p. Of course, the picture isn't near the clarity of high definition, but still strong with solid standard def transfers. Everything I've checked out is very representative of what the given discs actually look like in their native resolution; if that makes any sense. 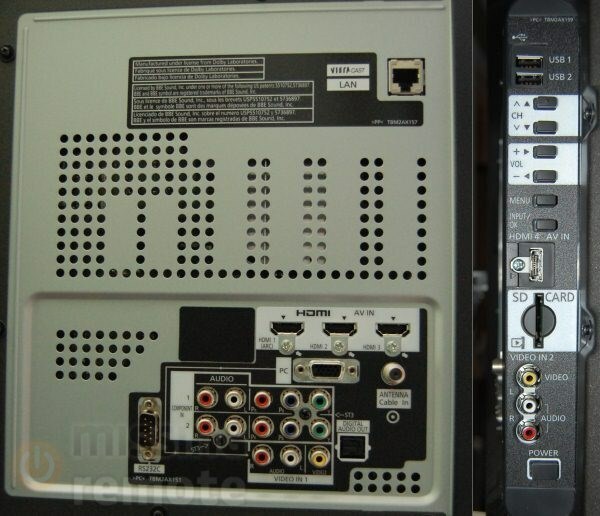 This player and VT25 also accept 480i standard definition via HDMI--which isn't common--meaning the Oppo can send the raw DVD signal to the display for scaling to 1080p instead of the player. While the result looks quite good, the Oppo has a slight edge, the VT25's processing in this particular respect made the image look a little plastic. Unfortunately, no PAL DVD resolutions are supported, curiously unlike my old DLP. At least the Oppo can convert PAL into NTSC; despite that option not being optimal. So far, so good. Even the "BBE VivA" faked surround sound feature is surprisingly clear and dimensional for flat panel speakers. I'm being careful with the first 100 hour plasma break-in process. Being mindful not to display black bars and cable logos for too long and enabling the "Pixel Orbiter" that very subtly shifts the picture periodically to avoid image retention. Oh yeah, concerning 3D and all that jazz, the VT25 reportedly bests Samsung's 3D displays at this feature (zero left/right crosstalk), but I honestly don't care at this point. This plasma's awesome 2D performance is more than enough for now. Although perhaps I'll eventually break down for Piranha 3D and Resident Evil: Afterlife 3D. If anything, I guess this means my Blu-ray reviews will only be more accurate from now on! That's a damn impressive backpanel! Sweet rig, man. Welcome to the wonderful world of 1080!